Borglum pictured a grand stairway leading up to the Hall of Records and the entablature. How it would be built soon became a sore point. Both Norbeck and Boland suggested that the stairway be built using the free labor of the Civilian Conservation Corp. Borglum would have none of it. Since the inception of the federal works program in 1933, the CCC had established more than twenty camps in the Black Hills, at times employing nearly a thousand men. 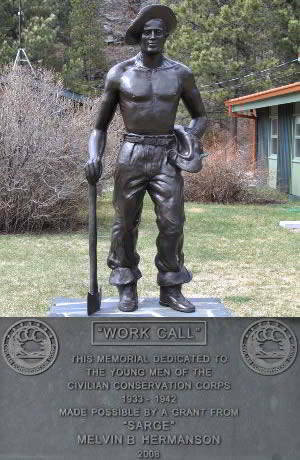 CCC crews fought forest fires and built dams, trails, and many of the facilities at Custer State Park, Wind Cave National Park, Jewel Cave, and Badlands. 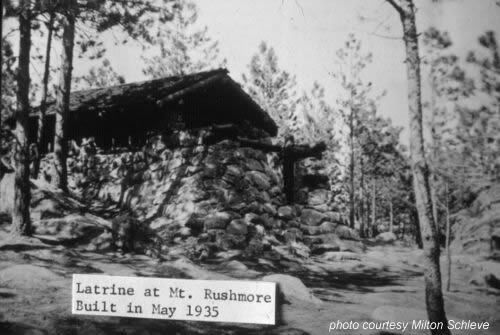 In 1935, John Boland had used CCC workers to erect a new restroom at Rushmore, which gave Borglum a chance to observe their workmanship firsthand. The CCC, he concluded, was a pack of "non-productive, incompetent, no-accounts" - a prejudice shared by his Rushmore crew, whose second favorite recreation, after baseball, was brawling with "Cee Cees" at Saturday night dances in Keystone and nearby Rockerville. Not much is ever mentioned about the Civilian Conservation Corps when Mount Rushmore is the topic of discussion. It is true that Gutzon Borglum was the genius behind the carving and that those on his payroll are rightfully credited with the faces carved from granite in South Dakota's Black Hills. The CCCs did however contribute in many ways to what is now known as The Shrine of Democracy. Many of the CCC Boys, Henry Gabur, Thomas Joyce, and Elwood Iverson for example, mention their work at Rushmore. The work varied from rubble cleanup to hauling bits up the mountain to other support jobs about the carving. 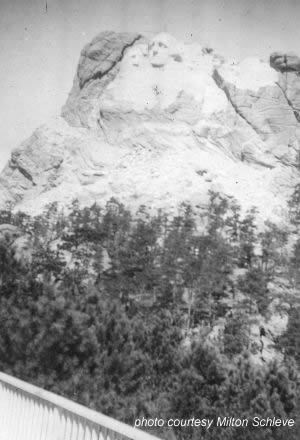 Elwood "Whitey" Iverson was a member of Camp Lightning Creek that was located west of Custer, SD. Mr. Iverson is also listed as a Rushmore worker on the large plaque located near the Avenue of Flags as well as in the archival records at the Memorial. In May of 2012 a volunteer videographer captured an Oral History Interview of Iverson conducted by the Rushmore Museum Specialist. A few minutes of that interview are available here courtesy Mount Rushmore National Memorial.